Education Secretary Betsy DeVos speaks during a House Appropriations subcommittee hearing on budget on Capitol Hill in Washington, Tuesday, March 26, 2019. 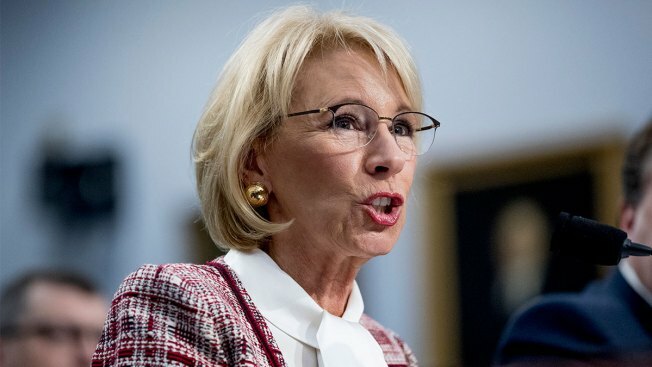 Education Secretary Betsy DeVos struggled before a congressional subcommittee on Tuesday to defend at least $7 billion in proposed cuts to education programs, including eliminating all $18 million in federal funding for the Special Olympics. Wisconsin Democratic Rep. Mark Pocan pushed DeVos on her proposed cuts to the Special Olympics and other special education programs during her testimony before a House Appropriations subcommittee, NBC News reported. When Pocan asked whether she knew how many children would be affected by the elimination of federal funding to the Special Olympics, DeVos said she did not know. "I’ll answer it for you, that's OK, no problem," Pocan said. "It’s 272,000 kids that are affected." DeVos responded, "I think that the Special Olympics is an awesome organization, one that is well supported by the philanthropic sector as well."